One corner has a minor ding. 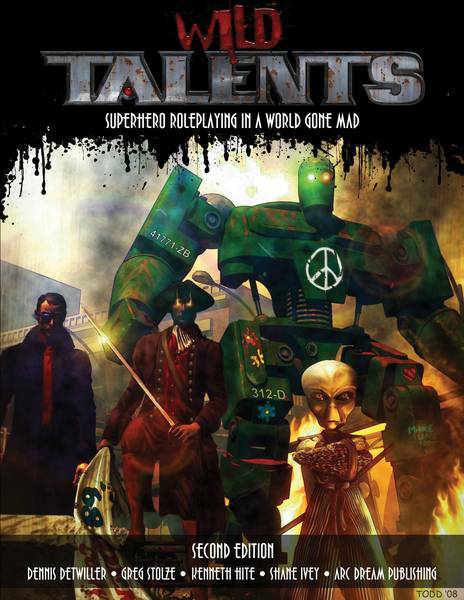 The Wild Talents game system the "One-Roll Engine" made famous by such games as "Reign," "Godlike" and "Monsters and Other Childish Things" is fast-paced yet detailed, with an emphasis on the dangers of heroism and the importance of willpower and motivations. The rules for creating superpowers from scratch offer tremendous flexibility, with enough simplicity to make it easy to play and enough depth to suit any gamer, and make the game eminently easy to customize. Wild Talents includes an in-depth alternate version of modern history, which builds on the acclaimed setting of the World War II game "Godlike" and extends it to the present day and to Talent-influenced events that reach into the depths of government secrecy and beyond the stars. Kenneth Hite's analysis of superhero campaign worlds guides you through the construction of wholly unique superhero settings, worlds whose history fits perfectly your vision for your setting and style of play. *Complete rules for creating characters, creating new powers, and running the game. *Guidelines for building alternate superheroic histories that fit your characters and style of play. *An extensive history of a "World Gone Mad," from the first appearance of Talents in World War II to the present day, more and more warped by human beings who have superhuman powers.